The Banana Head is designed for craggy bottom and weeds. Easily work rough weedy bottom. 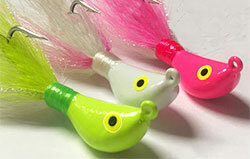 The forward hook placement allows the jig to bounce off of rocks and stumps, making it almost snag less for salt and freshwater angling and an awesome jig for summer flounder (Fluke) Available in many sizes and colors, with 3 different hook styles, and a durable powder coat finish with hand Painted eye's. 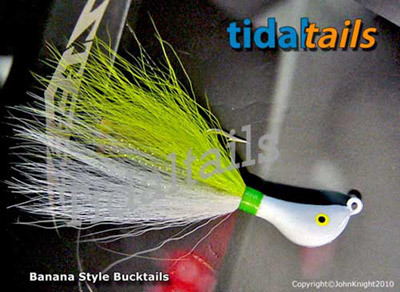 Banana Head Bucktails - Gamakatsu 2x Black Nickel Hooks. 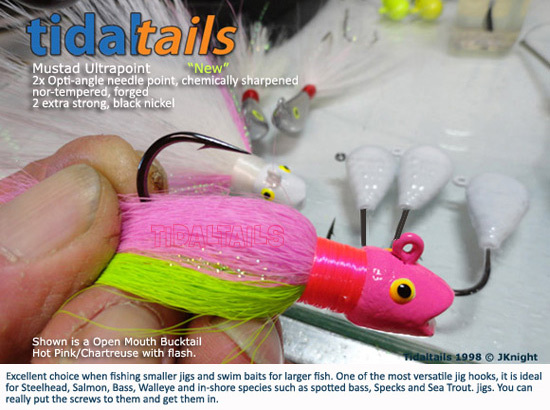 Banana Head BUCKTAILS - With H.D Stout and Sturdy, Mustad 2x Ultra Point Hooks. "NEW"